It is hourglass shaped, has 5 strings and features solid hardwood sides, head and fingerboard. Size: 86 x 20 x 9 cm. The Appalachian or Mountain dulcimer belongs to the psaltery or zither class of musical instrument and has been a folk instrument of the southern Appalachian mountains since the first pioneers settled there. It is a delightful instrument which is often strummed or plucked as an accompaniment to the human voice. In recent years it has evolved into a solo instrument, usually using the fingers, but sometimes bowed. Versatile, simple and easy to play, it is the perfect first instrument for a novice musician. 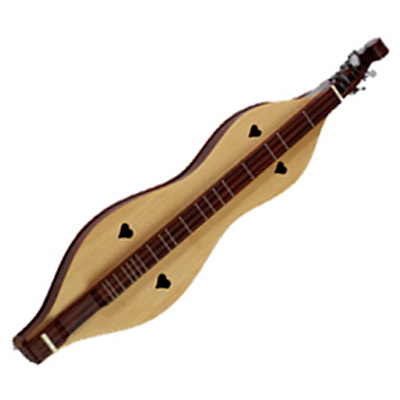 There are as many shapes and styles of dulcimers as there are players and mountain craftsmen. This Appalachian Dulcimer is more refined than some of the traditional, primitive mountain dulcimers. It is hourglass shaped, has 5 strings and features solid hardwood sides, head and fingerboard. The soundboard is made from solid spruce and it has a hardwood laminated back.